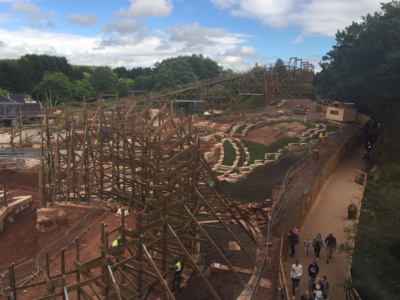 August 2017 News Round-Up – TowersStreet - Your premier Alton Towers guide! 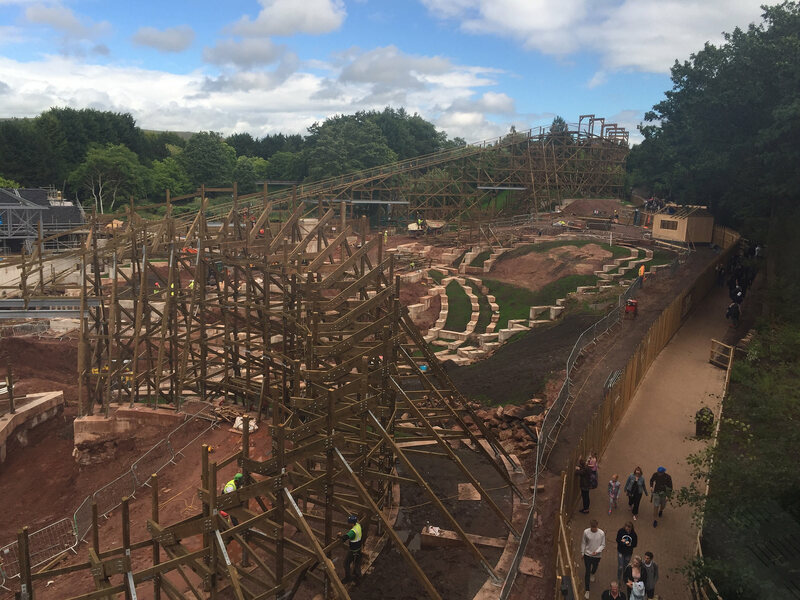 Summer is in full swing at the Alton Towers Resort, with plenty of sunshine and showers for guests to enjoy. 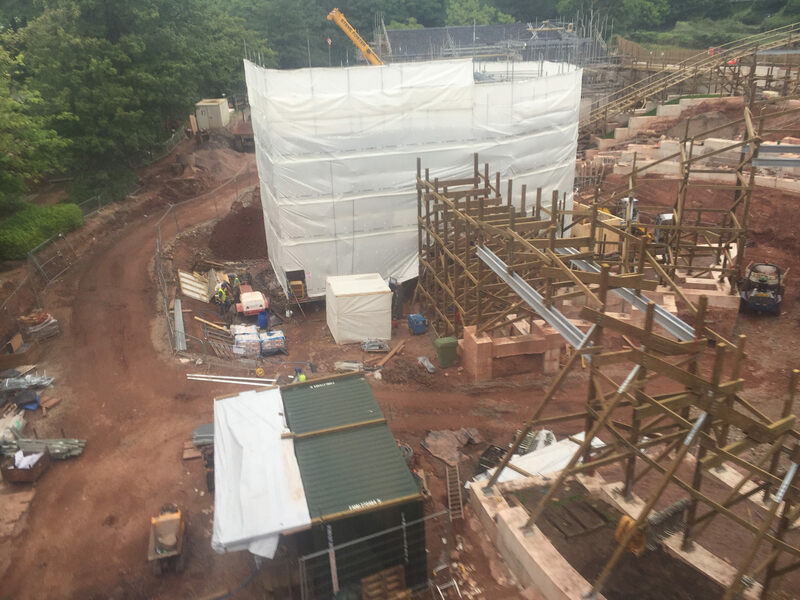 There has been a lot happening across the Resort, with the new CBeebies Land Hotel now open, SW8 construction gathering pace, and Scarefest preparations underway. Join us as we bring you the latest news from the park and the hotels. The infamous Scarefest Hearse was spotted at the bottom of Towers Street on 26th July, giving Halloween fans a first nod to the forthcoming event. Shortly after this, construction for the award winning Sub Species and Terror of the Towers was noted around the ruins. The Resort released a teaser trailer via their official Facebook page on 11th August, confirming Altonville Mines will also return alongside a fourth maze, but the park aren’t giving anything else away yet! On the same day the Scarefest teaser trailer was released, the one-day park entrance price was raised from £52.80 to £54 for an adult, and from £46.80 to £48 for a child. 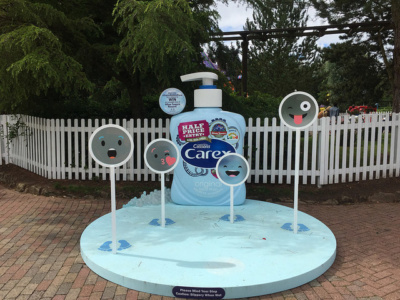 Various Buy one Get One Free offers are available across well-known brands such as Cussons Carex handwash, whose promotions have been seen within the park. An age restriction placed on the Rapids during May, June and July has now been lifted. The rule meant that guests under 18 years old could not ride unaccompanied, and must have an adult present. The signage from the ride entrance has been removed, and as far as TowersStreet is aware, no age checks are being completed. What a difference a few days make in the world of SW8! 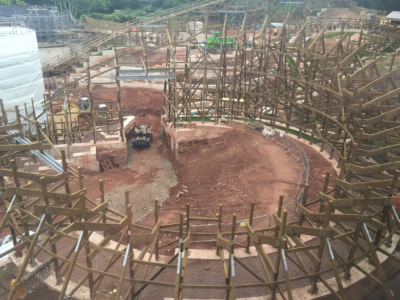 With regular trips to the park, it is clear to see the speed in which the new for 2018 wooden coaster is progressing. We’ve got some images from 3rd August and 11th August to show just how much vertical construction is taking place. We’ll be regularly updating the SW8 Planning and Construction album over on Flickr too. There have been TVs installed in some of the fencing along guest pathways edging the construction site. At present they are showing only the SW8 logo, but we’ll be keeping an eye out to see if this changes. Today (16th August), as part of a video released by the park to celebrate National Rollercoaster Day, a new SW8 teaser was revealed. It features some unusual rune like lettering which could provide a hint towards the potential theme. 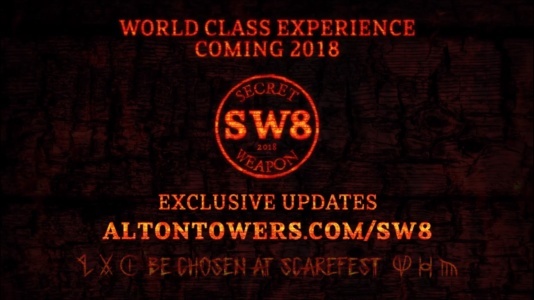 Alton Towers’ SW8 website has also been updated in the same style and features a brief history on past Secret Weapons, including a new video with more to come soon. 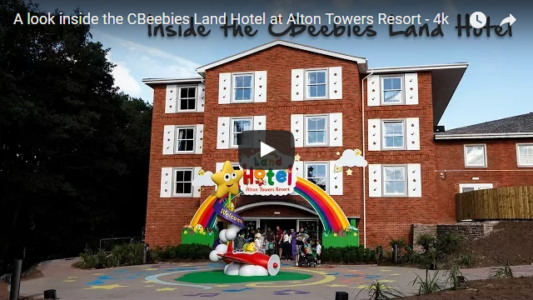 The long-awaited CBeebies Land Hotel opened to guests on Saturday 8th July, with a press preview taking place on Friday 7th July. Take a look inside the brightly coloured new addition, courtesy of Kip Hakes who has kindly given us permission to use his video. 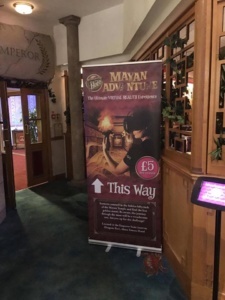 The former steak restaurant within the Alton Towers Hotel, Emperors Grill, has recently been closed to make way for a HB Leisure run VR experience called “Mayan Adventure”. The Emperor Suite has seen a number of different setups over the years, including once as a Scare Maze known as Room 13. As yet there is no end date for this new experience. 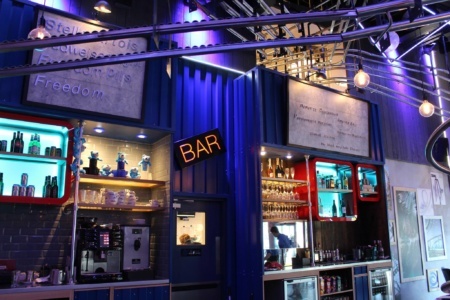 Keeping on the topic of restaurants, one of the more unexpected new additions is in the Rollercoaster Restaurant, where a new bar has opened! Diners can now select from a range of new drinks, from craft beers to cocktails, including the wittily titled “Ginball Whizzer” and “Th13tini.” Bear in mind that you still need a table to use the bar! 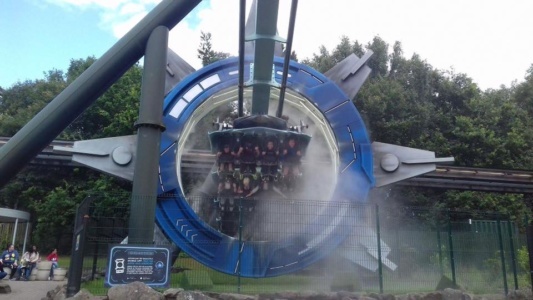 Following a period of closure lasting for over a month, Galactica finally fully reopened to the public on 22nd July after an evening of testing the previous night. While the reasons for the closure were not 100% confirmed, it is believed that the length of downtime was at least in part due to the park awaiting a piece of the lift hill mechanism to be delivered from B&M. One new aspect to the coaster since it reopened is that staff now ask whether or not guests will be using the VR prior to riding. 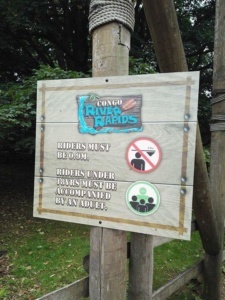 This is contrary to some claims when the ride opened in its current guise back in 2016 that some guests were told they could not ride unless they wore the VR! You can follow us on Facebook or Twitter for all of the latest news and remember that you can discuss all of the above and much more over on our Talk Forums.